As you might imagine at Vision6, we love email. Lucky for us too. Because as email marketers working at an email marketing software company, we spend a LOT of time looking at (you guessed it) – email. Often when we see an email we like, it gets shared with our team and we talk about the tactics used to help the email achieve its goals. It’s one of the many ways we stay on top of what’s happening in the email space and when we see an email that we really love . . . well, it inspires us. We recently realised that it might inspire you as well. 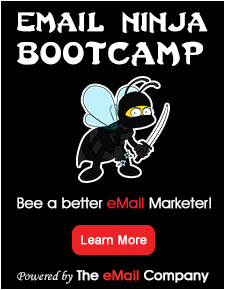 After all, there’s a lot to be said for learning from others and there are a lot of very smart marketers out there using email in very clever ways. So we went around and asked a few of our team members to share their thoughts on an email that they love. Read on to see what they had to say (click on the image to view an email in full). Timeliness is key to this newsletter and the fact that it arrives in my inbox towards the end of each week ensures that I have enough time to plan my upcoming weekend activities. Whilst there’s a fair bit going on in the email, the clean layout and vibrant colours really catch my eye. 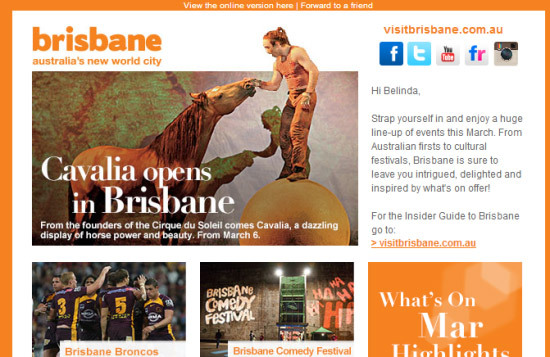 It makes it easy for me to scan and quickly see what is going on in and around Brisbane. Plus there is a good variety of interesting content for locals and visitors with things like the ‘I love my Brisbane’ photo competition. Key learning: Timely and interesting content is a powerful combination when it comes to effective email marketing. 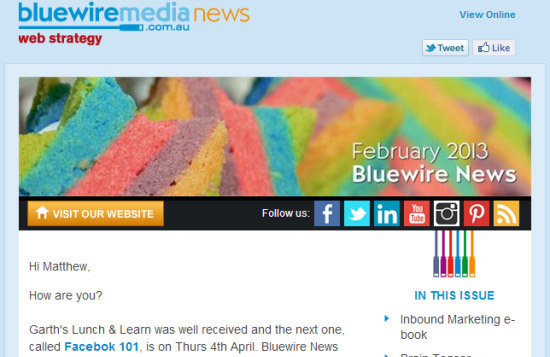 There’s a lot to like about how Bluewire Media go about their email marketing. Their newsletters look nice and the content is always great. Whilst they’re jam packed full of content, Bluewire Media do a fantastic job of keeping me engaged by using a variety of techniques. Firstly, they use a personal tone which makes me feel as if the newsletter is being sent directly from Adam and Toby to me. There’s also a good mix of images peppered throughout the newsletter which make it easy for me to get the gist of the story even if I’m only scanning. And saving the best for last – there’s the brainteaser. Completely different from the rest of the newsletter’s content, the brainteaser is a bit of fun that rewards me for reading and invites me to reply. Key learning: Long emails with lots of content can work well when you engage your reader with interesting, relevant and entertaining content. Avid’s emails are always short and to the point. Using their extensive preference options, I’m able to filter out their marketing material and just receive the content I crave. They tend to strictly adhere to one message per email. Because the emails are short and I only opted for educational content, I never just delete an Avid email. After I read them I’ll usually save them in case I need to refer back to them later. Their great content means I don’t get annoyed, their product stays ‘front of mind’ and seeing people working ‘magic’ using their products makes it feel really desirable. You can probably tell, but I feel a strong sense of brand connection with Avid because of their great content. Plus the dark email design actually reminds me of editing rooms – dimly lit and masculine. 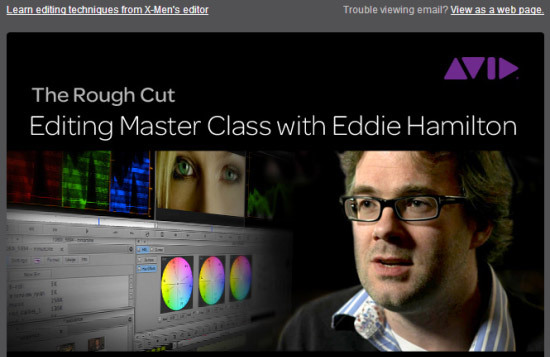 When I open an Avid email, I instantly think editing and genuinely feel a tingling desire to drool over the editing systems on their website. Key learning: By understanding your audience and providing a valuable and consistent experience with your email marketing, you’re able to create brand advocates. 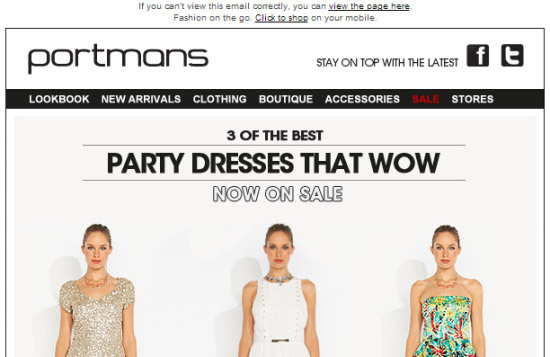 Aside from getting a heads-up about any sales, I love Portmans’ newsletters because they look good – really good. Portmans’ emails never look crowded or busy and generally only feature 1-3 outfits, which means I’m not overwhelmed with too much to take in. The headline text and symmetry of the models captures my attention and entices me to scroll through the entire email, even when I’m reading it on my mobile phone. I view a lot of emails on my mobile so I love that there is a link at the top to ‘shop on my mobile’. It shows me they really understand how their readers wish to interact with their brand. On the topic of links, I really appreciate the links at the top of the email that lead to different areas of the online store. Being a bit of a bargain hunter I like being able to jump straight to the sale section from the email. Key learning: A mobile-friendly email design is very important when promoting products to an audience that is likely to read your email on their mobile devices. 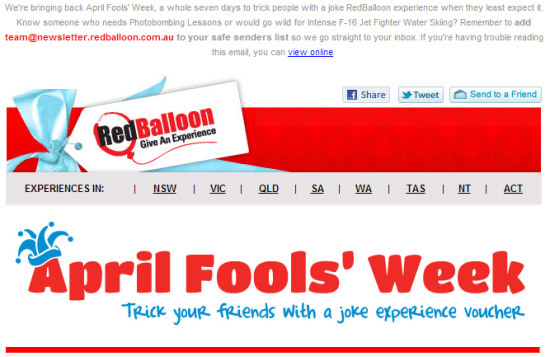 I love this clever one-off April Fool’s email by RedBalloon. Firstly what I love is the subject line. It hooked me in instantly with ‘It’s April Fools’ Week – Trick your friends!’ (I’m a prankster at heart). The email was set in the usual attractive email template that I have become familiar with from RedBalloon, but with the April Fool’s twist. This allowed me to get the idea and get involved straight away. It had me crying with laughter and sending joke experiences to all my friends. Very clever viral marketing! There are links to landing pages for each experience where they have taken the joke further (even more crying with laughter). Also clever, as they are drawing me back into the website where I can view legitimate experiences to purchase. Key learning: Thinking outside the box and using humour to engage readers is a powerful way to create viral email campaigns. P.S. These are just a handful of the emails we love and draw inspiration from. But what about you? 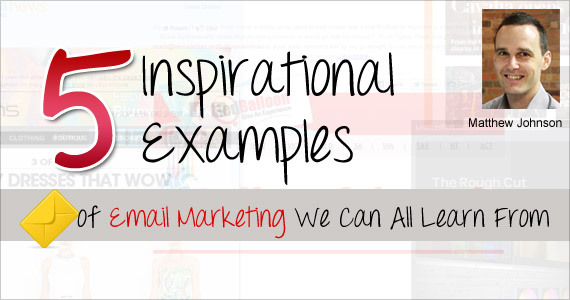 Share your own examples of email that you love in the comments section below.